The Art Reserve Bank issues coins – that is, the bank exchanges euros for works of art in the form of exclusive coins. 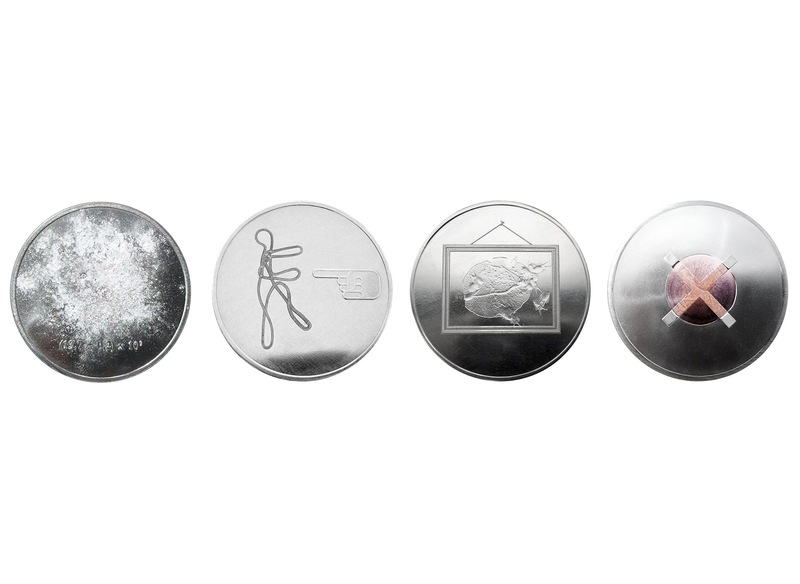 Every month a different artist designs a series of four coins: every week a new coin. Twenty of these Art Works will be minted every weekday. So the issue is only 100 copies per coin. These unique coins are available against the current exchange rate at the Art Reserve Bank. 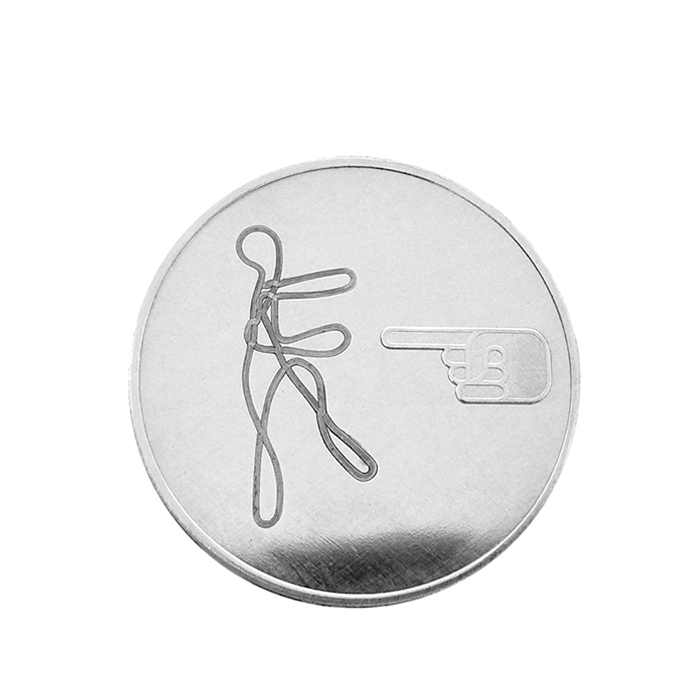 You can purchase the coins either at the bank in Eindhoven or at the online teller. Every coin is issued for one week only. Coins can neither be ordered in advance nor purchased after the issue has ended. It is however possible to order the entire series of the current artist online. The total circulation of all coins is restricted and registered in advance. For after five years the bank will cease to exist. 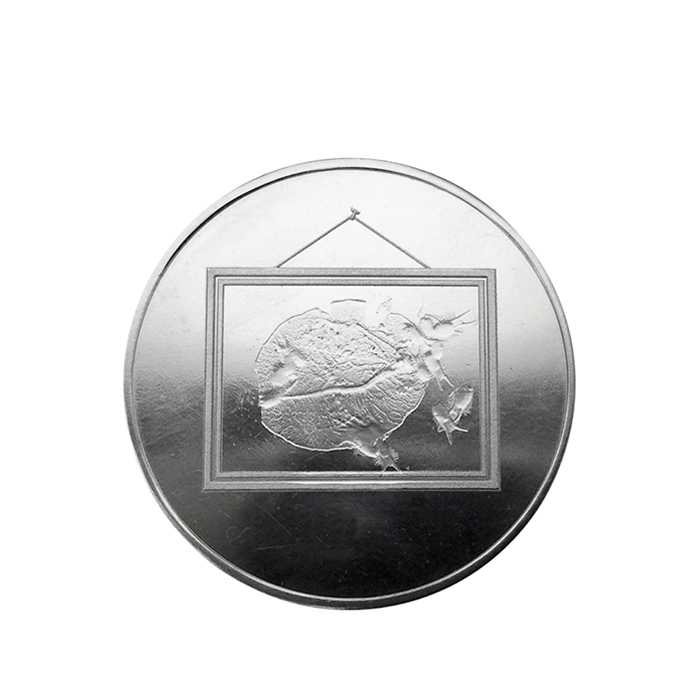 By then a total of 25.000 coins will have been issued: 250 unique emissions — each in a circulation of 100 — designed by 60 different artists. 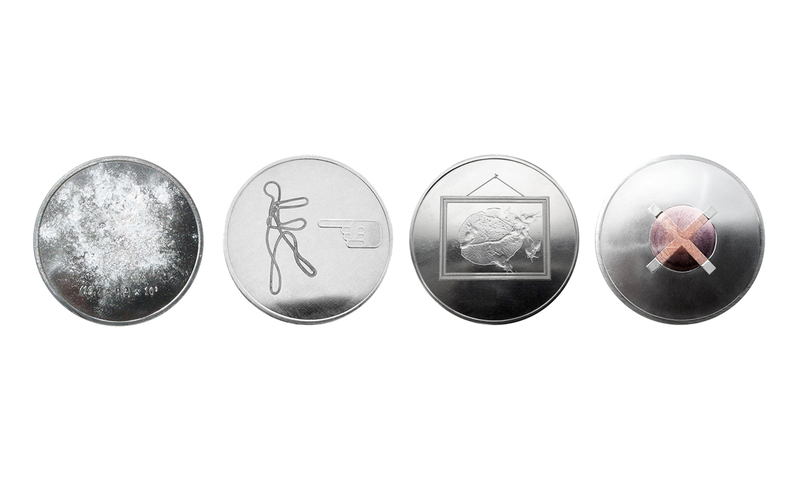 In 2013 Ted was asked to design 4 coins: Art, Man, Money and Big Bang. The Art Reserve Bank sells the coins with a ‘money-back’ guarantee. What is more: whoever returns the coin can make a profit. How much depends on the time between issue and refund. To make it easier we keep to a (not compound) interest of 10% a year. Obviously the guarantee period is restricted to the five years of the bank’s existence. 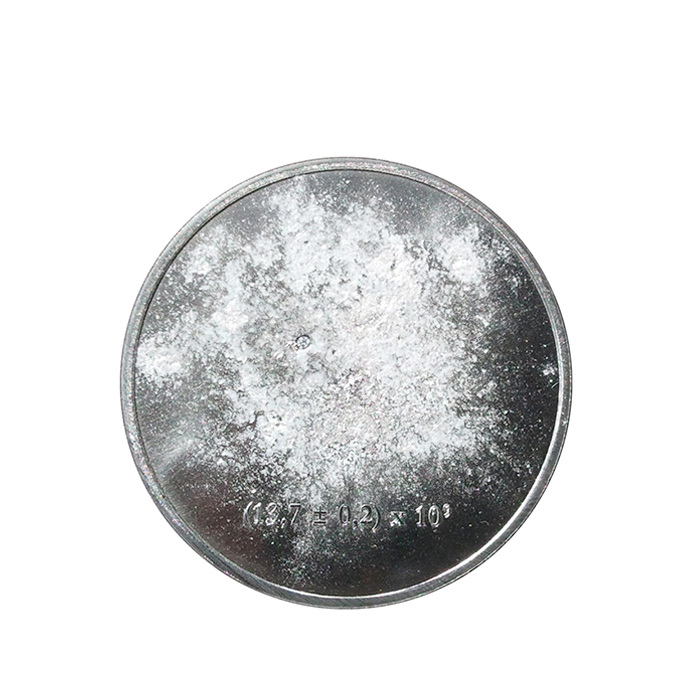 The issue date of the coin determines the actual worth of the deposit the owner has at the bank. Of course this deposit is not personal: every owner of a coin can exchange it back for euros. The estimate is that ultimately less than 10% of the owners will really do this. In accordance with the reserve requirements of the fractional banking system, 10% of the turnover will be kept in reserve by the bank. So the bank stays well within the regular liquidity requirements. (With a capital ratio of 10% the bank even exceeds the new Basel-III standards en will easily qualify for a triple-A rating). The Art Reserve Bank has its own dealing room: an online market place where the public can exchange, buy and sell previously issued coins. Price fluctuations at this market place define the actual exchange rate of the coins. Hence the real value of the coins is being determined by the public. This is a really important economic aspect of the experiment: the value of the coin is not artificial (defined by a diffuse currency market), but intrinsic (defined by what the public is here and now actually willing to pay in euro’s for the artwork). With this intrinsic value we introduce in fact a new standard: no gold standard, but an Art Standard. The most important financial data is that the bank sells its coins invariably at daily exchange rates. At the start of the project this rate is set at € 100. With a turnover of 33% this price will be sufficient to cover operating costs. The idea is that the warrantee and the built in scarcity will gradually boost the exchange rate. Due to the guaranteed refund value the exchange rate can never decline. The experiment is a fundamental economic research into the real value of this new currency. In other words: we are practically testing whether a sufficient amount of coins will be sold to secure the Art Reserve Bank´s survival. 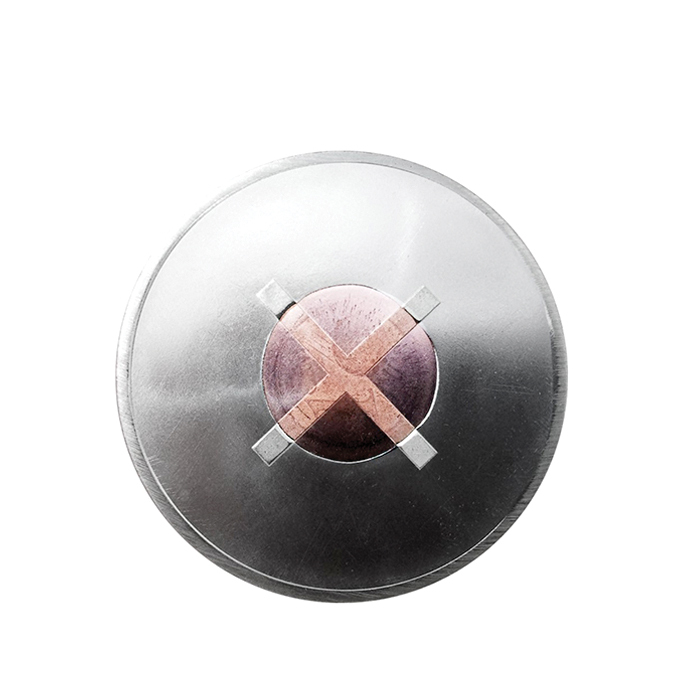 If not enough coins are sold to cover the costs, the experiment will fail. Also if too many people return their coins and claim the 10% interest, the bank will soon go bust. So in this sense the bank operates exactly like any other bank. Practise will show how long the Art Reserve Bank will last. In any case not longer than five years, as the experiment will then end and the bank liquidates itself. Obviously the bank will by then have insufficient capital to answer all calls on deposits. We think however, that very few people will actually want to exchange their Artworks back to euros. Which immediately proofs the possibility of Art as a intrinsic value of a reserve currency.